File this under the “don’t try this at home” category. Unfortunately, all too many of us are. One day my husband arrived home from the supermarket with a product that piqued my curiosity. He couldn’t find our usual brand of Bell & Evans breaded, frozen chicken tenders—I like their thick, meaty texture, which makes them seem a bit closer to the real thing—and instead got Applegate Farms Organic Chicken Strips. Melanie Warner found that two brands of frozen chicken nuggets liquified when left out for two weeks. I heated up the strips, which looked more like nuggets, and tasted them. The texture was airy and spongy, not very meaty. The chicken struck me as highly processed, but the box said that what I was eating was, in fact, “minimally processed.” The listed ingredients seemed simple enough—organic chicken, water, organic rice starch, sea salt and natural flavor. Intrigued and confused, I added the remaining frozen nuggets to the collection of foods that I was leaving to age, as research for my book. (And, yes, I know that this was not a rigorous scientific experiment.) I prepared myself for an awful smell. After about two weeks, the Applegate nuggets, which I’d placed in a Ziploc bag left slightly open, had essentially liquefied, with the outlines of the individual chicken pieces no longer visible. The whole thing was soft and mushy to the touch, and the color had darkened. In early 2012, pink-slime beef became a poster child for distrust of industrialized food-processing, but chicken endures considerably more high-tech poking and prodding than beef. The chicken in the supermarket’s frozen-food aisle is seldom the same thing you’d prepare at home. It may sometimes start off as recognizable cuts of meat and use familiar ingredients, but then machines take over. After this experience, I talked with Chris Ely, one of Applegate’s founders. 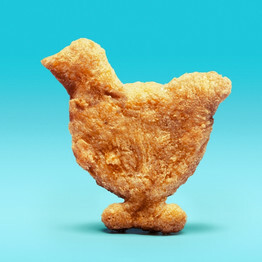 He said that the company was definitely “not in the sponge business.” He added, “When you bite into our nuggets, you’ll notice that our meat is a little loose in the center.” More-conventional manufacturers, he said, mix their product excessively, using various additives to absorb water and bind everything together snugly, lowering the cost. When I told Mr. Ely about my experiment, he said that though he had never tested his product this way (who would? ), the chicken might be more prone to disassembly because it isn’t bound together with additives. Another company’s nuggets (this time with sodium phosphate and other additives) dissolved in the same way when I later tested them. But the Bell & Evans tenders did well with the two-week test: I got foul-smelling chicken, but it remained intact. I told Mr. Ely that my results suggested that his chicken was more of a maximally processed product than a “minimally processed” one, as the box said. “I can see your point,” he said, and he eventually explained how the strips are made. A hand-deboned whole chicken, together with other listed ingredients, is coarse-ground and then fed into an extruder that forms it into identical pieces. After that comes a breading device, a fryer, cooking in an oven and freezing. Making packaged frozen nuggets that resemble real chicken may not be possible without dialing back some of the industrial manipulation. Bell & Evans tenders, sold raw, are subjected to one quick frying to set the breading, instead of Applegate’s complete oven cooking. There’s no extruder. Mr. Ely says, “In today’s food-safety world, uncooked really scares me,” though Bell & Evans has never had a recall of its products. The benefits of a safe food supply are undeniable, but they sometimes come with trade-offs that can be hard to grasp—especially when the word “organic” appears on a package. Those nuggets from Applegate Farms certainly weren’t the worst thing in the world, but each one was more air and less chicken than I could have known. Such compromises are quietly embedded into much of our processed food. Even with plenty of information on the package, it’s rarely clear what we’re eating. —Ms. Warner’s book, “Pandora’s Lunchbox,” will be released Tuesday. A version of this article appeared February 23, 2013, on page C2 in the U.S. edition of The Wall Street Journal, with the headline: My Adventures With Liquid Chicken.